HOLIDAYMAKERS looking for the out-of-the-ordinary can today do time in the one-time cells of what was once one of England's toughest prisons, a hell-hole housed within the 5-metre thick walls of the country's historic Oxford Castle. And strange as it may seem, when the prison was first built 350-odd years ago, those incarcerated in those cells had not only to contend with over-crowding and infestations of rats, mice and cockroaches – they actually had to pay their warders for their prison accommodation. And to eat, they also had to buy their meals from those same warders too. 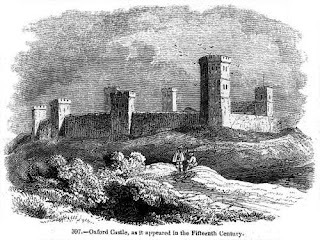 The vast Oxford Castle was built by the Norman baron, Robert D'Oyly Snr between 1071 and 1073 after he arrived in England with William the Conqueror, who upon becoming King of England gave D'Oyly expansive tracts of land across what is now Oxfordshire. Much of the castle was destroyed during the English Civil War, and it ultimately passed into the hands of Oxford's educational Christ Church College which leased it out to a local family who built a privately owned and run prison for the government within the remaining castle walls in the mid-1600s. Prisoners included petty criminals, murderers and so-called "rebellious scholars." The College made a tidy profit from the arrangement but finally disposed of the castle and prison, that came complete with a gallows and executioner, in the 18th century when prison reformers were campaigning generally against overcrowded and filthy gaols. It was subsequently acquired in 1785 by the Oxford County Justices who had it more humanely re-designed and re-built. And the man who did much of the re-construction, Daniel Harris actually ended up as Governor of the new prison on a handsome contract from the County Justices, zealously adding more and more cells; within a century so much of what remained of the Castle had been swallowed up by the prison, that in 1888 the whole lot was acquired by the British government and renamed HM Prison Oxford. For more than 100 years it served its role as a penal institute, until in 1996 it was deemed to have passed its use-by date, closed, and together with the remains of the castle handed-over to the Oxfordshire County Council. The site was classified as a Grade 1 Listed Building and a Scheduled Monument, with the castle walls, one of the original towers (St George's Tower) and the crypt the only major remains of Robert D'Oyly's once-grand 11th century structure. But with the Oxford Prison facilities still in basically sound condition within the castle, the County Council decided to redevelop the whole castle complex, winning a GBP3.8-million grant from the National Lottery Heritage Fund to turn it into a living community centre with shops and boutiques, cafés, bars, galleries, private housing apartments – and a luxury hotel. And to further fund these works, in the years leading up to the castle's re-opening in 2006, parts of the former prison were hired out to film companies who shot scenes there for TV shows including Inspector Morse, Bad Girls and most famously The Bill, as well as the feature films 102 Dalmatians, The Spy Game and Lucky Break. 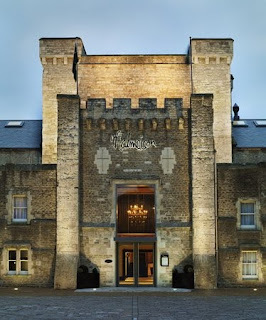 Visitors to Oxford can today stay in the unique Malmaison Oxford Hotel whose 95 rooms and suites have been created within former prison cell blocks, prison governor's living quarters and one-time prison offices. These spacious accommodations have been created by merging several cells or offices into one luxury room or suite, some of which have views overlooking the one-time exercise yard, and there are even split-level suites with balconies with wider castle views. Cells used for corporal punishment and to house condemned prisoners awaiting the hangman, have deliberately not been included in the accommodation areas. 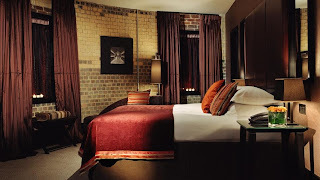 Prices start from AU$223 per night for two in a luxury double room, and range up to $669 for a huge Duplex Suite with 4-poster bed and home cinema. Market days and theatrical performances are held in the former prison courtyard, and conducted heritage tours take visitors back through the castle's near-1000-years of history. With its hotel, entertainment and heritage facilities the old castle can be a one-stop destination in itself, while Oxford's many other fascinating attractions are just a stone's throw away. THE once-foreboding entrance to Oxford Castle now provides a luxury welcome for guests at the unusual Malmaison Oxford Prison Hotel. 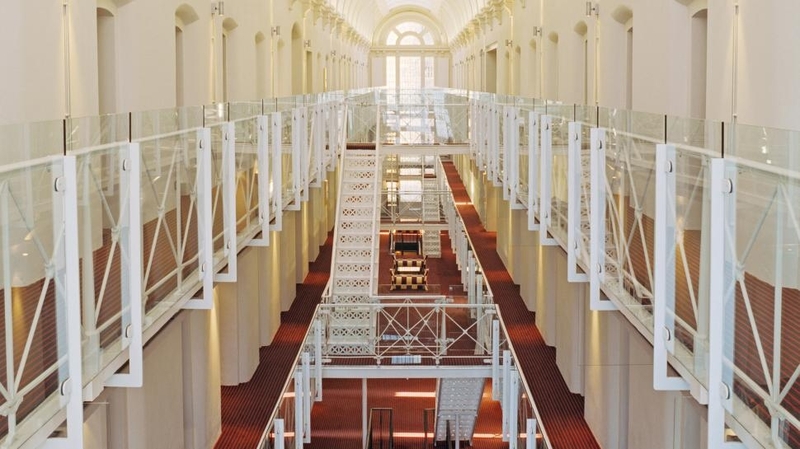 PRISONERS didn't have it as good as this: a luxury hotel room created within the one-time Oxford Prison. 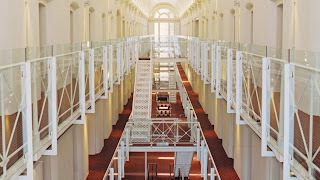 WHAT's possibly the world's most unusual hotel atrium… guest rooms still have original prison cell doors for "atmosphere." HISTORIC sketch of Oxford Castle in the 15th century.